WASHINGTON -- Defense Secretary Chuck Hagel on Wednesday approved a recommendation by military leaders that all U.S. troops returning from Ebola response missions in West Africa be kept in supervised isolation for 21 days. The move goes beyond precautions recommended by the Obama administration for civilians, although President Barack Obama has made clear he feels the military's situation is different from that of civilians, in part because troops are not in West Africa by choice. Obama: Health care workers fighting Ebola doing "God's work"
Hagel said he acted in response to a recommendation sent to him Tuesday by Army Gen. Martin Dempsey, chairman of the Joint Chiefs of Staff, on behalf of the heads of each of the military services. They cited numerous factors, including concerns among military families and the communities from which troops are deploying for the Ebola response mission. In explaining his decision, Hagel noted that the military has more people in Africa helping with the Ebola effort than any other segment of the U.S. government. "This is also a policy that was discussed in great detail by the communities, by the families of our military men and women, and they very much wanted a safety valve on this," he said at a public forum in Washington. Just over 1,000 U.S. troops are in Liberia and Senegal supporting efforts to combat the virus. Hagel also directed the Joint Chiefs to provide him within 15 days a detailed implementation plan for how the supervised isolation of troops will be applied. He also ordered the chiefs to conduct with 45 days a review of this new regimen, which Hagel called "controlled monitoring." "This review will offer a recommendation on whether or not such controlled monitoring should continue based on what we learn and observe from the initial waves of personnel returning from Operation United Assistance," Hagel's spokesman, Rear Adm. John Kirby, said in a written statement, using the official name of the military mission against Ebola in Africa. "The secretary believes these initial steps are prudent given the large number of military personnel transiting from their home base and West Africa and the unique logistical demands and impact this deployment has on the force," Kirby added. "The secretary's highest priority is the safety and security of our men and women in uniform and their families." The Army, acting on its own, put a small number of returning soldiers on a 21-day quarantine in Vicenza, Italy earlier this week, CBS News correspondent David Martin reported. The soldiers being monitored include Maj. Gen. Darryl Williams who was the commander of the U.S. Army in Africa but turned over duties to the 101st Airborne Division over the weekend, Martin reported. The soldiers in isolation are in a building that is used as a command headquarters. It has communications - secure communications - so that Gen. Williams and his staff can do work, Martin reported. It also has a gym. Maj. Gen. Gary J. Volesky, commander of the 101st Airborne Division, assumed command in Liberia on Saturday of the growing contingent of U.S. forces in Liberia. "You need our support demonstrated with action not words, and action is exactly what we are going to provide," Volesky said. A 25-bed hospital in Monrovia, Liberia's capital, should be fully operational in the first week of November. American doctors and nurses will care for infected health care workers there. About 600 U.S. service members are now in Liberia - which was established almost 200 years ago for former slaves from America, according to the U.S. Department of Defense. 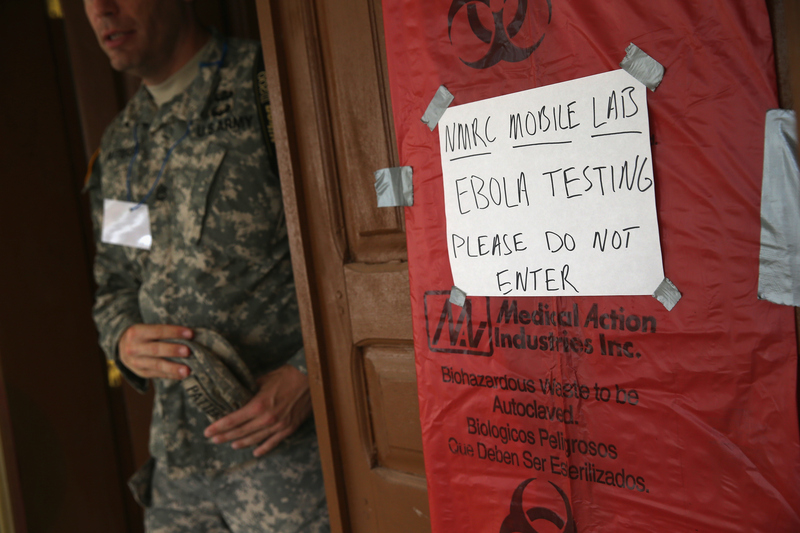 The U.S. also set up Ebola testing labs.